Thanks, babe! 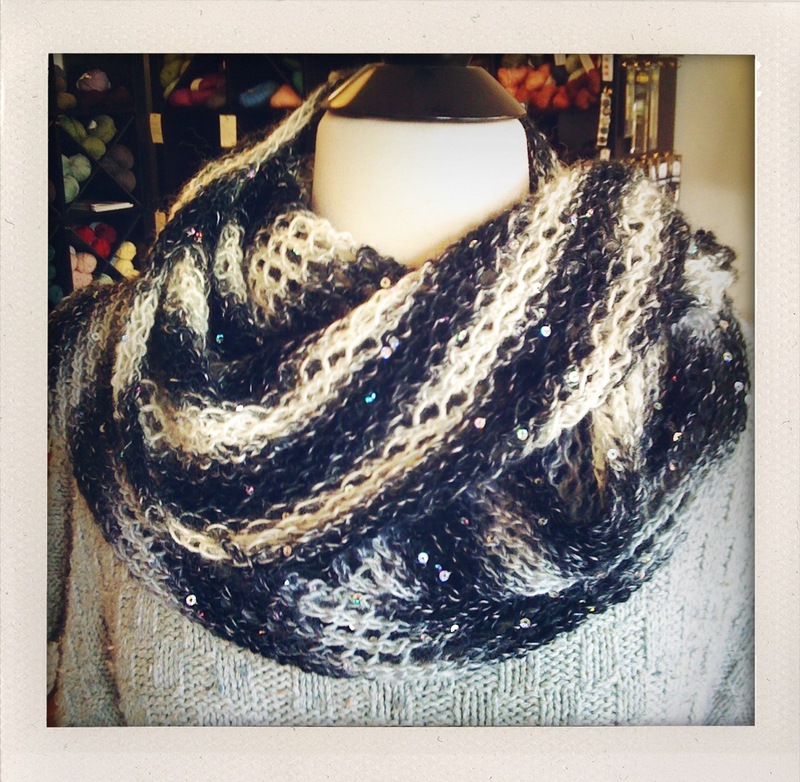 I knit this up using 2 balls of Rozetti Polaris, each in a different colorway, so one side of the piece is grey and cream stripes, and the other side is black and cream stripes. 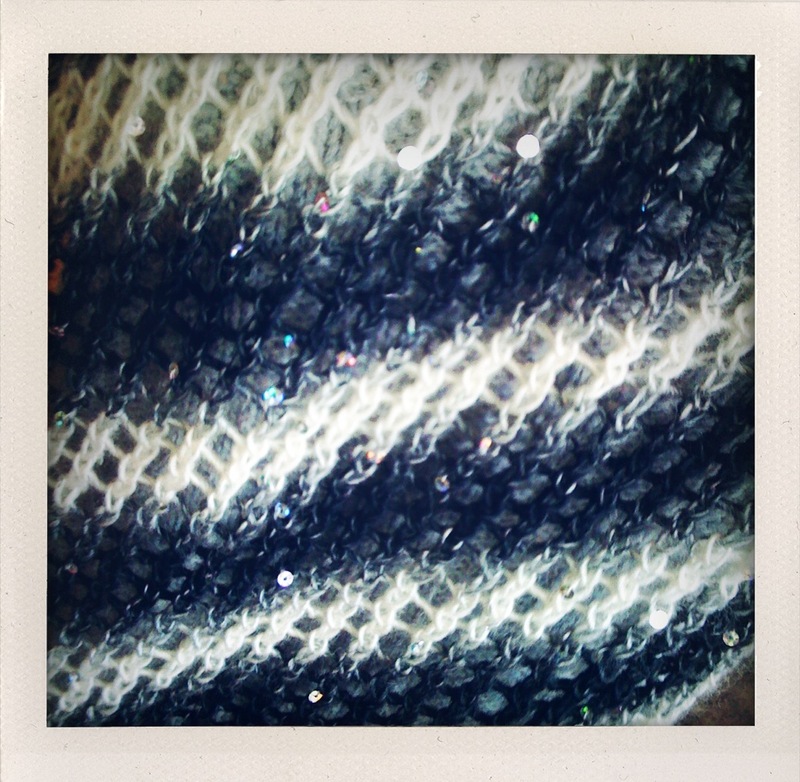 This unique yarn not only changes color as you knit it, but it truly is dotted with a “sequence” of sparkly sequins throughout. 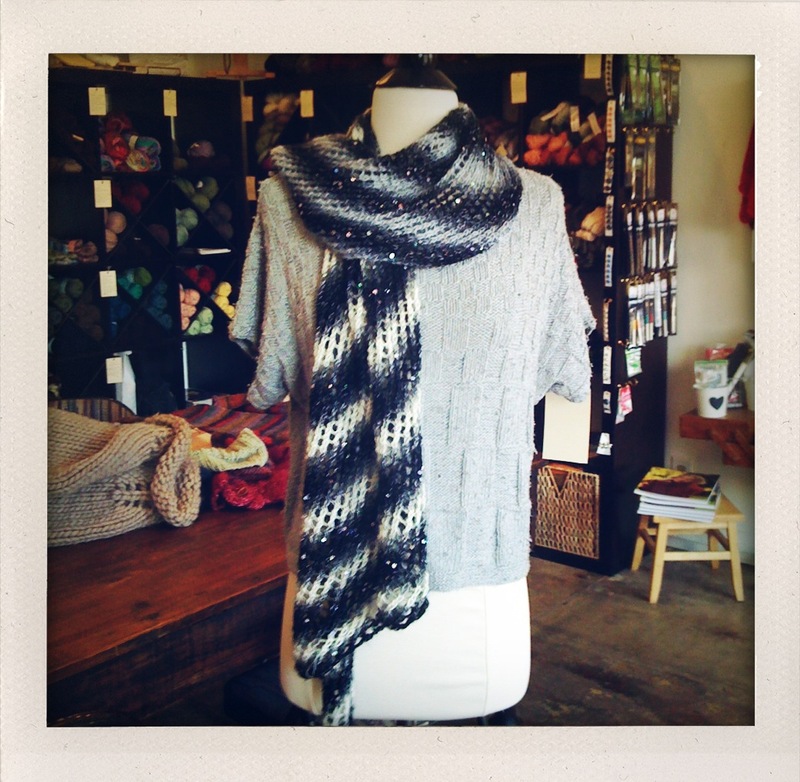 And the simple bias lace texture adds a twist to the basic scarf. Materials Needed: 2 balls Rozetti Polaris, US size 11 needles, jumbo darning needles. **You can use any size yarn and needles you like. The bigger the yarn, the wider the shawl will be. Feel free to experiment – this stitch looks beautiful in any yarn! Cast on 59 stitches loosely. Row 1: Sl 1 kwise, purl remaining. Row 2: Sl 1 pwise, K1, *YO, k2tog. Repeat from * until 1 st rem., K1. ***If that pattern looks like Greek to you, see the one below with a fuller explanation of terms. Row 1: Slip the first stitch knitwise by entering the stitch like you would if you were going to knit it, and then just moving the stitch from the lefthand needle to the right without actually knitting it. Purl the remaining stitches. Row 2: Slip the 1st stitch purlwise by entering the stitch as if you were going to purl it, and then just moving the stitch from the lefthand needle to the right without actually purling it. Knit the next stitch. Now you will begin the simple bias lace pattern. Yarn Over (YO) by bringing the yarn to the front of the needles as if to purl, and then knit the next two stitches together (K2tog) by entering two stitches at one time and knitting them as if they are one. You will repeat this YO, K2tog pattern until 1 stitch remains. Knit that stitch. Repeat Rows 1 and 2 until you use up both balls or until you reach your desired length (you can keep trying it one as you work). We make every effort to test patterns for accuracy, but should you encounter anything that doesn’t make sense, do not hesitate to let us know at thelittleknittery-at-gmail-dot-com. Thanks Julie, this would be lovely for my mother!